I mowed some of the lawn today. Hopefully, I can get one more section done before it gets dark. This lawnmower is probably on its last legs. You may recall it's 26 years old. I've put quite a bit of money into it this summer, and I have to say that it's running better than it has in several years. But lets go back to the beginning. 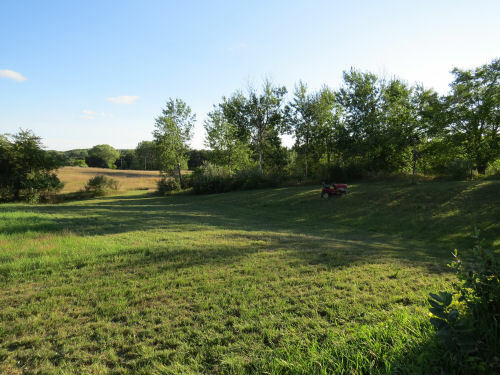 You may recall my entire week in May that I spent getting the mower running after a year of sitting... a very large paperweight. Then the transmission gave problems. That was fixable, because it's so old it just uses belts. So that was a week in the shop. After that came the really funny story I haven't told you. 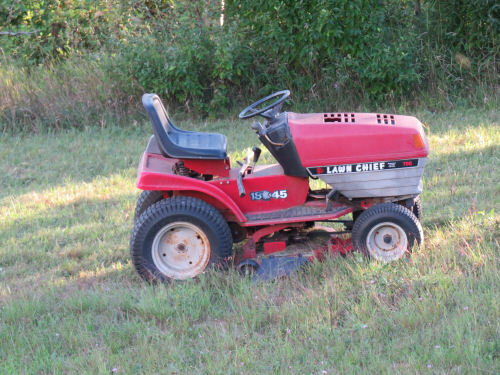 I took it out one afternoon and while trying to mow in my normal 3rd gear it was going really slow, as if it were in 2nd. So I thought maybe 4th would be like 3rd and shifted. Whoa! 4th was reverse! Glad I was well away from anything when I had that surprise. So I decided that slow was better than nothing, so I just put it back in 3rd which was 2nd and kept going. Then I found that putting on the brake or clutch did nothing at all. No stopping! So I figured I'd mow until I ran out of gas or was done and would just turn off the key. John (my mower guy) picked it up. Well. The problem was pretty weird, and must have been either partially or completely broken for a long time. The frame where the back axles connect was broken on both sides. That's why the belts couldn't get themselves in the right places for the gears. It's a wonder the whole thing didn't fall apart. So he welded that and brought it back. Started it up to drive off the trailer and parked it. Then it rained for several days and the mower just sat where he had left it. When I tried to start it... nothing. I charged it up. Nothing. Note of explanation... you have to have the mower blade disengaged or it won't start. So that lever has to be down, and usually even held down with a little bit of force. But now the lever was floppy again. John came again. The spring that controls the tension on the lever was just lying under the mower, broken. It must have decided it was too tired to play after being parked. So the mower sat there for several more days till he located a spring that was the same. Now we are pretty much up to the present. You can see I got a lot of lawn mowed today. 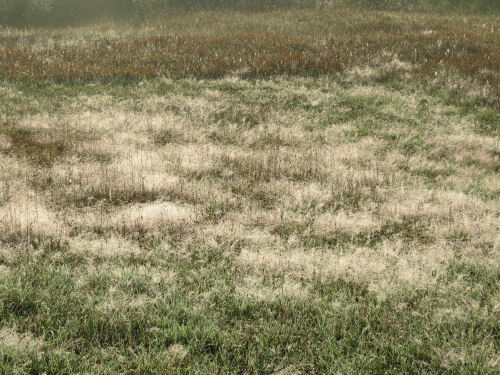 But not all- note patches with longer grass. Here's the goofy, glitchy part. As I said, it's now running really well. In fact it's relatively so quiet compared to the last couple of years it's quite nice. But it only runs for about a half hour till it gets heated up. Then it coughs and quits and won't start till it cools down. So I can mow in spurts. Please, God, just let me get the entire lawn cut one more time this year! Remember how Maggie used to demand more orange in my blog posts. Well, now Jade has taken up the cry. Only she wants white, of course. I saw all these things today. You've seen the witch grass before, but it was more white than silver this morning. 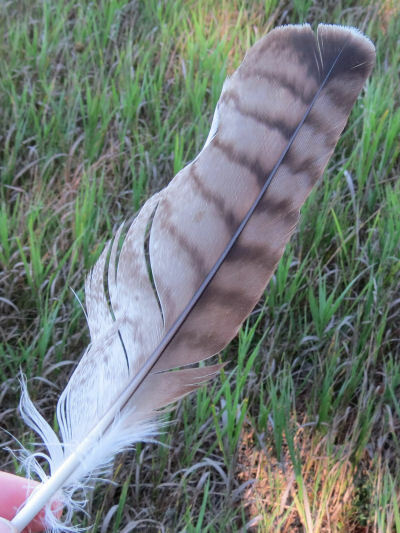 A hawk feather was lying in the field. Hope the bird won't miss it! 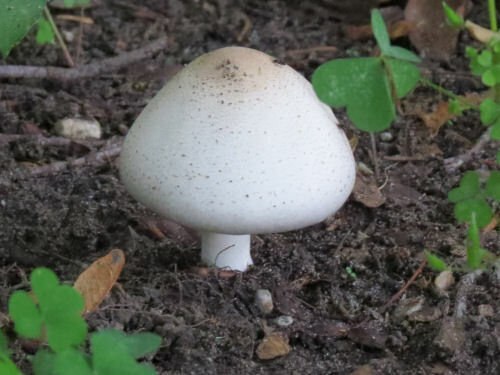 A white mushroom in the cemetery surrounded by oxalis, but you could almost imagine shamrocks and leprechauns. And, some pokeweed just starting to bloom. This one is small, and won't succeed (because it's growing through my steps, and it's going to get ripped out!). 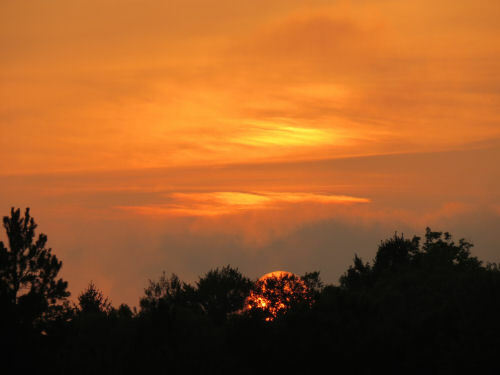 Finally, in memory of Maggie, an orange sunset (and because it was there, and I loved how it was just hazy enough you could really see the round sun. It was a fairly productive day- nothing major, but I got a lot of annoying little tasks done or made progress on them. "I'm a Good Girl, I Am"
No, not Eliza Doolittle. Jade. Jade the dog. You've met Jade before (called Whitey for a very short time when Ester first got her). She really likes to do a lot of this. She's the calmest dog I think I've ever seen. But she's mine for two weeks now. Ester's kayaking trip is going well. Every day I get GPS coordinates and a short message from her brother's Spot unit. 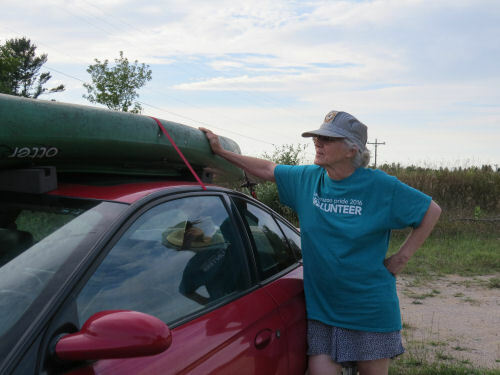 They've paddled far from where they put in, and today they said, "Everything's fine. 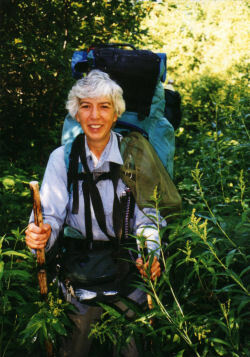 We're having a great time around Caribou Lake." 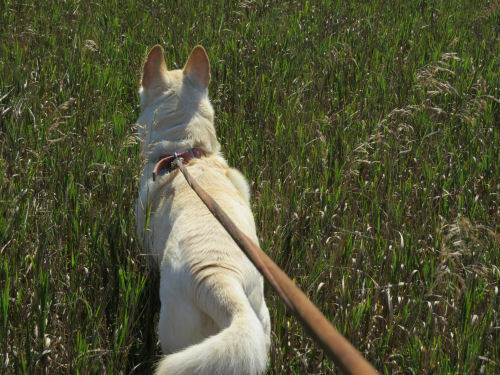 I'm trying to get Jade and me on the two walk a day regimen I always had with my other dogs. She's good with the short morning walk, but poops out near the end of the afternoon walk, which isn't even a mile. But she hasn't been getting much exercise. And Ester has no idea how old she is. If she was the age her former owner said, she'd be 11 now, but that doesn't make any sense. Sure, she's not high energy, but she doesn't act or look like an old dog. Anyway, we are having fun. 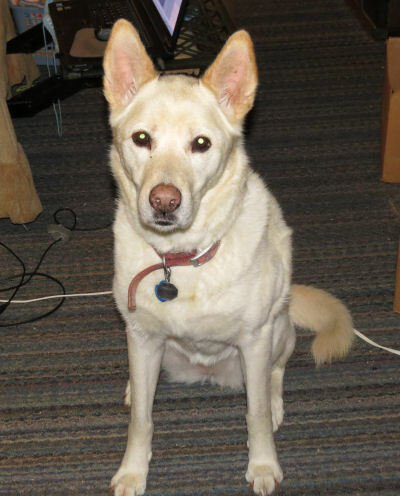 And, Ester loaned me her vacuum to deal with the white dog hair! Perhaps she'll have more stamina after two weeks of walks. Well, you know me and projects. They limp along until they (sometimes) get finished. 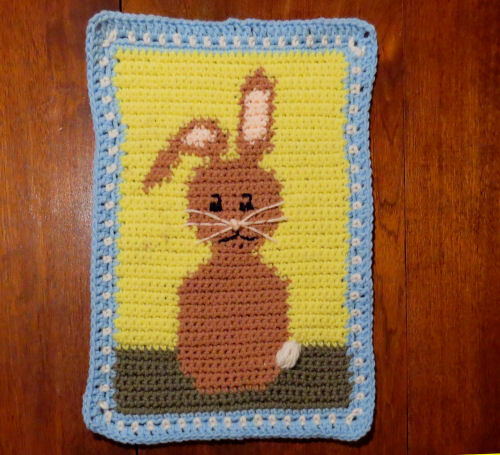 Remember the rabbits? They aren't exactly hopping along. However, a third one has now joined the ranks. Do you think there is any chance at all that I could finish six more in the next twelve days? I didn't do either of these things today. But I crossed paths with those who are. 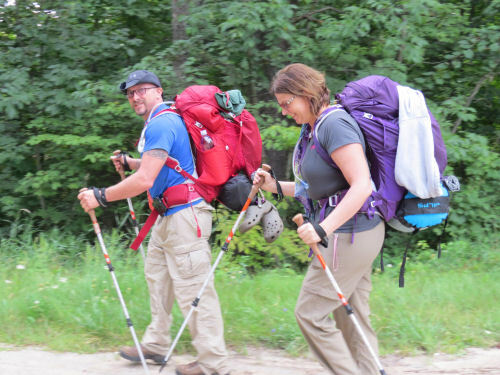 The day started by spotting two hikers who are going to backpack 105 miles on the North Country Trail. I dropped them off at Hodenpyl Dam at 8:15 this morning. The day is ending with my friend Ester here to sleep for a few hours before she heads to Canada for a kayak trip with her brother and nephew. 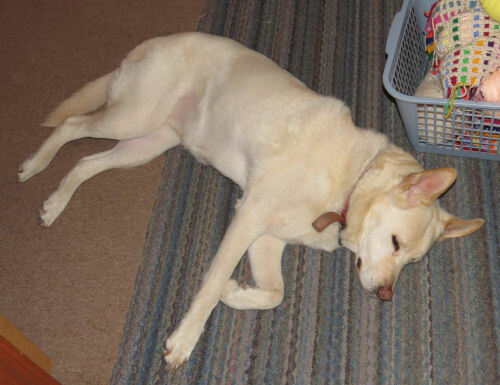 Jade the dog will stay with me for two weeks. Me... no fun adventures today. I worked between the hikers and Ester, and I'm headed back to work in an hour or so. That's OK, today was about helping others on their way. 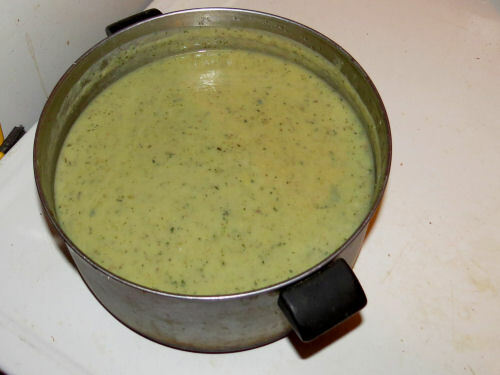 Why yez, it'z zucchini zoup. If you are going to have vermin in your kitchen, you might as well get something interesting from the experience, right? I had a small bag of wheat flour that had been sitting in a styrofoam tray for quite a long time. 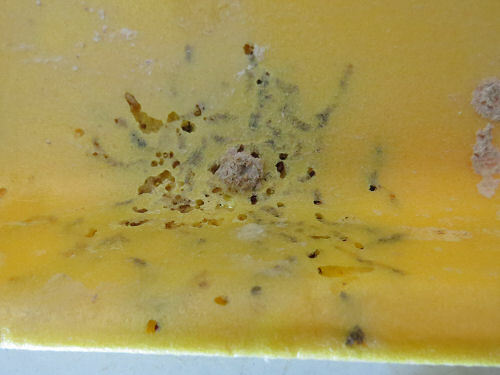 I knew I was going to have to throw it out because the mice had chewed into the corners, and I could see that those tiny beetles that like flour had also taken over the territory. But I hadn't quite gotten into dealing with the mess yet. Today I did. Just threw the whole thing into the compost and peeled off the plastic bag. But look what I found in the styrofoam tray. 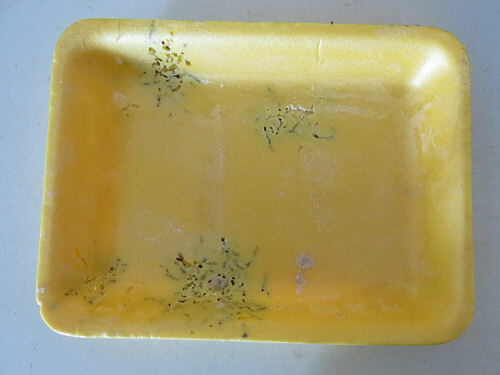 The tray has beetle galleries in it! Who knew they'd chew their way through styrofoam just like they do in wood? I guess they can digest it, since I didn't see hoards of dead beetles. Is there a waste management application here? When I was working on my Masters (in that topic) we learned that actually everything, even the nastiest chemicals, can be broken down naturally. The big question is... can they be broken down in a meaningful time frame? Anyway, here's a closer look. 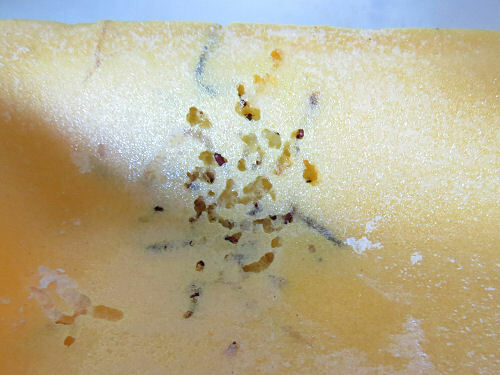 Yes, those dark spots you see through the thin foam are more beetles, and/or larvae. Hope this didn't gross you out. I just think it's fascinating. And, also, there is no particular pattern to the galleries like there is with some of the wood eating beetles. You know any hike/outing where I see a new (to me) plant is an extra treat. I thought I didn't see a new one on this last hike, but tonight when I was looking at the pictures I discovered I was wrong. 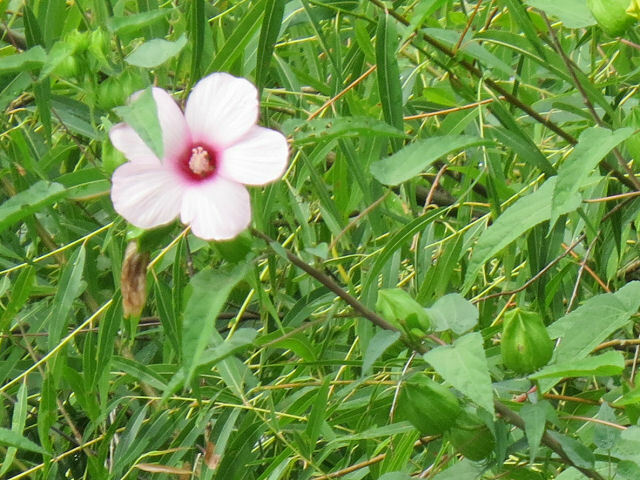 I thought this was Swamp Rose Mallow. Pretty much a look-alike from a distance. 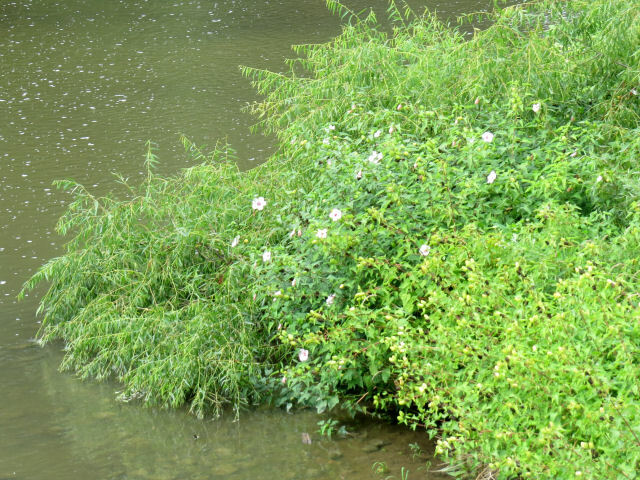 But then I got a little excited when I looked in the book and saw that the dark throat is a better match for Halberd-leaved Rose Mallow. But did I get a good enough picture of the leaves to be sure? I did! Very distinctive. 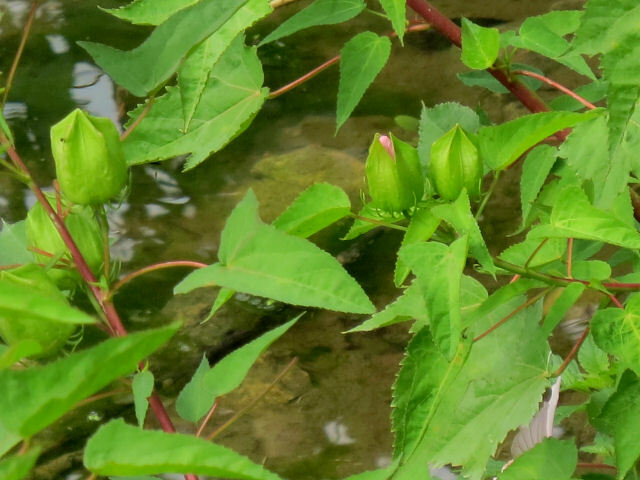 The name, Hibiscus militaris comes from this shape like a halberd or spear. Also note the funky buds. 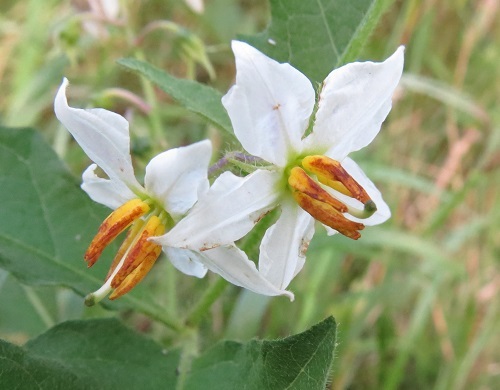 If I showed you this plant and asked you what it is, you might not know the exact answer, but you might say that the flowers look a lot like a tomato, or a potato, or maybe deadly nightshade. You would be right on! 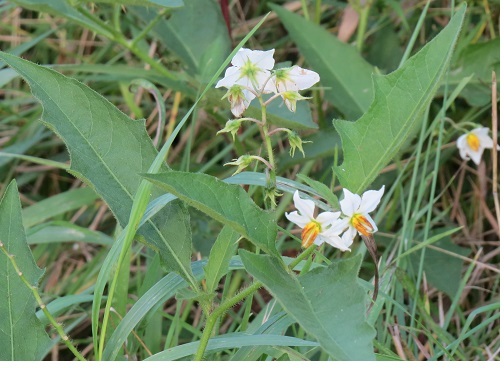 They are all members of the Solanaceae family of plants. 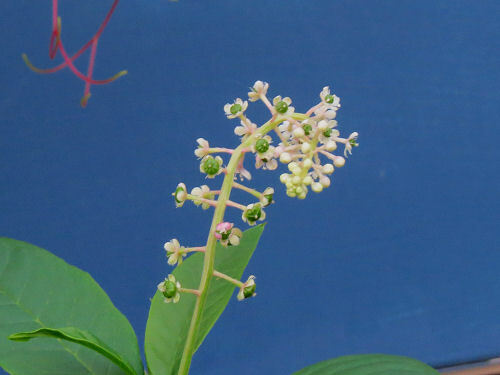 The flowers of this one can be white or purple. Very distinctive shape. But the giveaway to identify this one is the soft spines on the stem. 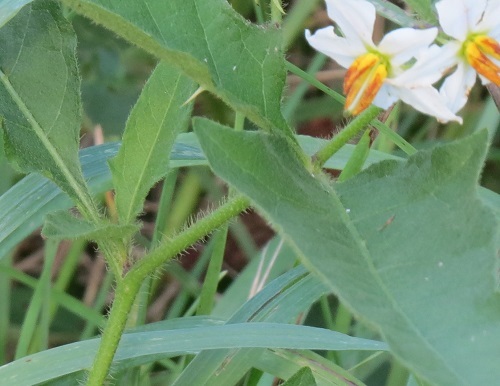 Solanum carolinense, horse nettle. I'd love to show you a picture of this butterfly on some beautiful flower. But it landed on my car door, so that's the background you get. It's a northern pearly-eye, Enodia anthedon. 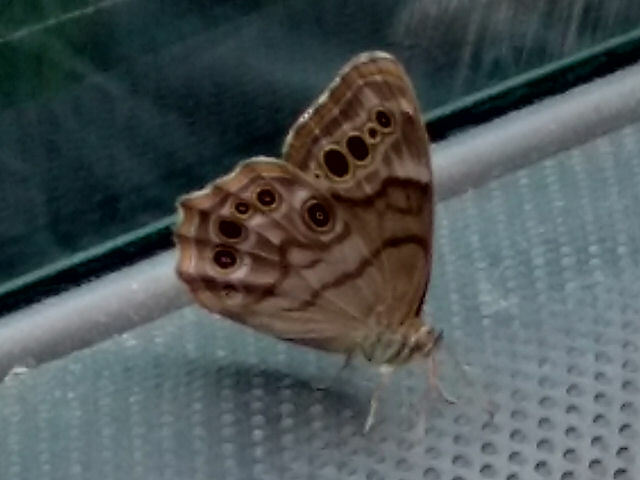 This is not an uncommon butterfly, but I don't recall noting it before. I probably wasn't looking closely because it doesn't have bright colors. Shame on me; it's really pretty. There is a southern pearly-eye, and a creole pearly-eye. They get progressively lighter colored. Yesterday was a day of exhaustion, a sore foot, and rain. My goal was to do as little as possible, and I succeeded. Today was better. This afternoon the sky was blue, the air was cool and I took a 3-mile walk just so I wouldn't forget how. Ha! 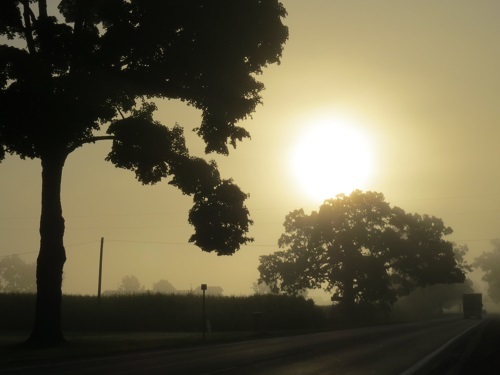 Yesterday morning as I was leaving Ester's house I missed the more beautiful picture I wanted to take. Had to settle for this one. Still, it's pretty cool. I got extra work hours, so have to scoot along back to work very soon. It's all good. 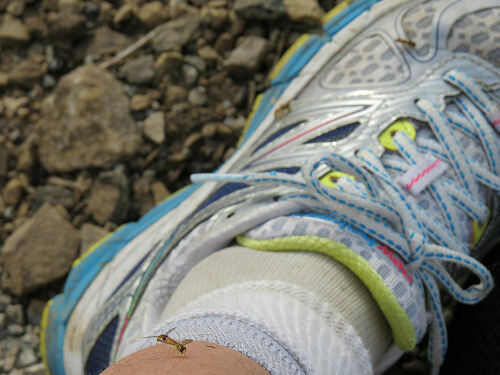 The defining insect of this hike was the sweat bee. 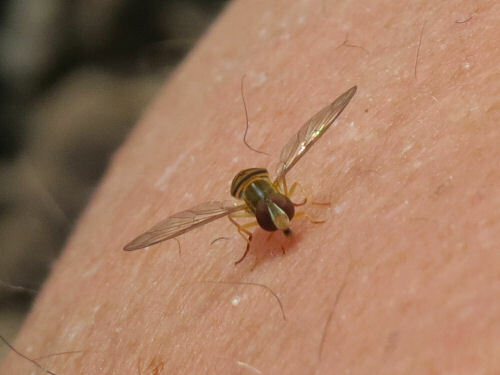 Sure there were cicadas in the trees (but not like the last trip at ALL), and the wonderful cricket, and lots of butterflies, but the sweat bees were an unavoidable nuisance. There are two on my leg and several more on my shoe in this picture. So, Ester was looking at one rather closely one day, and she said, "It doesn't look like a bee. It has fly eyes and fly mouthparts." Huh. I'd never looked that closely before. Actually, I haven't seen too many of these since I was a kid, and I'm not a fanatic about insects the way I am about plants. Anyway, it turns out she is right. 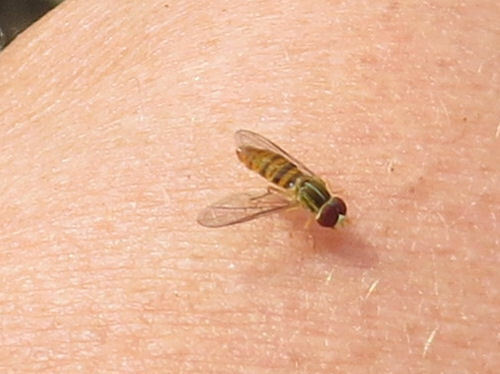 These are actually hoverflies. There are lots of kinds of them. It might be Episyrphus balteatus, or maybe not. I didn't collect any for further study (unless I find some dead ones in my gear somewhere). I bet Ester has a few folded in the tent! They can not bite or sting, but they certainly tickle. They like to just sit on your sweaty body and touch you gently, hoovering up the sweat. Tickly things make me nuts! However, they are really good. Their larvae eat tons (probably literally) of aphids which damage all kinds of plants. So, I learned something really interesting. Any my request is that you try not to swat the sweat bees. I think I only killed a couple when I just couldn't stand it any more.